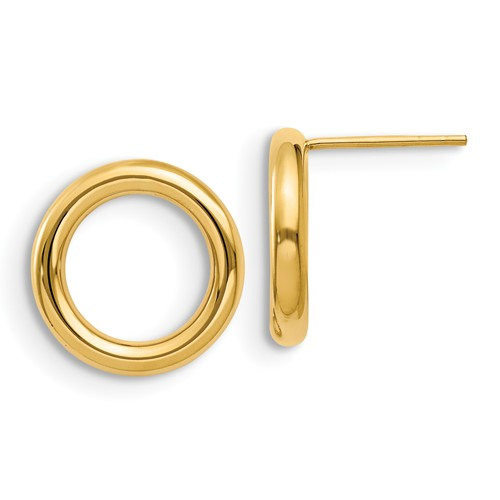 These highly polished circle post earrings in 14K yellow gold from Apples of Gold Jewelry have a lovely little circle, open in the center, with an easy to use post and push back closure design. The beautiful yellow gold finish of these earrings is a warm addition to your jewelry collection. The circles, which measure 0.59 inches (15mm) each, are perfectly round and open, yet still hides the post and push back closure. These earrings would pair nice with other earrings as well, for multiple piercing, but look stunning and sophisticated on their own. We guarantee our Circle Post Earrings, 14K Yellow Gold to be high quality, authentic jewelry, as described above.